"Turns out, we spoke too soon," begins an email Apple sent out on Friday, March 22. It is the second fusillade in a new marketing campaign that outlines the main reasons consumers love the iPhone 5. In the Friday email, the company set the record straight: As of last Thursday, Apple has bragging rights to nine -- not eight -- straight J.D. 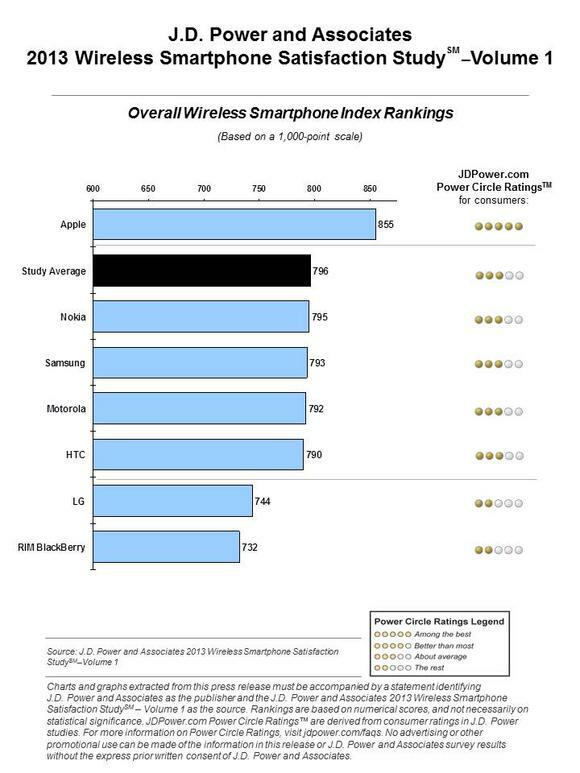 Power and Associates awards for "Highest Customer Satisfaction with Consumer Smartphones." iPhone 5. Source: Apple press product images. The first round of the well-timed campaign came just two days after Samsung launched its flagship Galaxy S4. The campaign is great news for Apple investors, after Samsung dramatically stepped up its advertising in 2012, even outspending Apple. 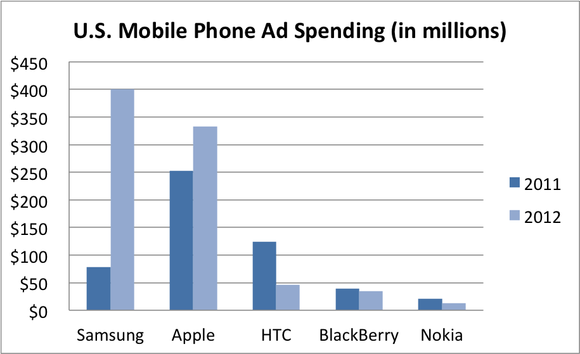 Samsung's increased advertising spending during 2012 is nothing short of massive. Samsung spent more on advertising than HTC, BlackBerry , and Nokia combined. Even more mind-boggling, the company more than quadrupled its 2011 spending on advertising. Marketing experts -- like ex-Apple ad executive Ken Segall, the man behind Apple's legendary "Think Different" campaign -- have suggested that Apple is losing some of its cool factor. While Apple continues to stick to its traditional product-based ads, Samsung has spent a fortune on people-based ads featuring celebrities. And Samsung's approach is working, Segall asserted several weeks ago. The premise behind the ads is to show consumers exactly what there is to love about the Galaxy line. According to Segall, Apple needs to step up its marketing in order to counter Samsung. Apple's new "Why iPhone" campaign "appears to be trying to bridge that divide somewhat by focusing on how the iPhone experience has drawn so many loyal and happy customers," MacRumors' Eric Slivka explains. Will the mobile ad war heat up in 2013? There's no doubt Apple's top management team is keenly aware of Samsung's remarkable inroads in the mobile market in 2013 -- in both smartphones and tablets. According to estimates from Gartner, Google's Android-powered smartphones grew 88% year over year from 2011 to 2012 while iOS smartphone sales grew just 23%. This brings the Android OS share of total smartphone market share to 70% in the fourth quarter of 2012, up from 51% in the fourth quarter of 2011. Meanwhile, iOS market share fell from 24% to 21%. To be fair, Android is spread out across a whole spectrum of smartphone brands and models, with a far lower average selling price. Even so, Samsung's Galaxy line represents the largest portion of Android sales. Samsung's made inroads in tablets, too. The company shipped 7.6 million tablets in the fourth quarter of 2012, according to Canalys -- that's a 226% increase from the year-ago quarter, far more than Apple's 48% increase. Samsung's gains are undoubtedly at least partly due to the quadrupling of its ad spending. The evidence goes both ways. BlackBerry and Nokia, two companies that reduced their already minuscule advertising budgets in 2012, saw smartphone sales decline in 2012 by approximately 44% and 85%, respectively. Going into 2013, Apple seems to be more serious than ever about its image. One of the first signs of a more aggressive stance on advertising was when Apple's senior VP of worldwide marketing, Philip Schiller, slammed Android with a tweet, linking to a Mobile Threat Report that highlighted many security and malware vulnerabilities of the Android OS. Schiller not-so-subtly jabbed at Android again in an interview with The Wall Street Journal when he discussed the fragmentation and sub-par experience of the Android OS. Now Apple's "Why iPhone" campaign highlights the first official foray into the new and more aggressive approach. Prominently displayed at the top of the page is the J.D. Power and Associates respected award for Highest Customer Satisfaction. The company's streak of nine wins in the consumer wireless smartphone category truly sets Apple apart from its competitors. The award is based on a survey that reviews performance, physical design, features, and ease of operation. Apple continues to maintain a significant lead over its competitors. The company's score of 855 is significantly higher than that of runner-up Nokia. Apple "performs particularly well in physical design and ease of operation," J.D. Power's announcement notes. Apple could easily wield a small chunk of its $100 billion cash hoard to outspend Samsung on advertising if it really wanted to. In January, ad analytics company Ace Metrix declared Samsung the "Brand of the Year winner in the technology category" due to "delivering consistently good creative across all of its brands while producing more than three times the volume of new creative than tech leader Apple." Will Apple respond? If its recent aggressive turn in marketing is a sign of things to come in 2013, there is a big chance Apple could make a comeback. Whatever happens, marketing will play an important role in 2013. I'm willing to bet Apple's cash hoard will work in the company's favor, and the company remains a top pick among my outperform CAPScalls. The article Apple's iPhone Claims the Consumer Satisfaction Crown Yet Again originally appeared on Fool.com. Fool contributor Daniel Sparks has no position in any stocks mentioned. The Motley Fool recommends Apple and Google. The Motley Fool owns shares of Apple and Google. Try any of our Foolish newsletter services free for 30 days. We Fools may not all hold the same opinions, but we all believe that considering a diverse range of insights makes us better investors. The Motley Fool has a disclosure policy.